Current multi-needling RF devices are used for tightening the dermis and their target is not confined to sebaceous glands but just dermis. However, to treat acne the target should be confined to sebaceous glands. For these reasons, the multineedling RF device may improve acne temporarily in some cases but worsen it in others. In other words, sebaceous glands can be destroyed depending on the level of energy delivered to the target tissue, but insufficient energy will only raise the temperature of sebaceous glands temporarily without destroying them. Then, what is the right level of energy for destroying sebaceous glands? Sebaceous glands are a type of holocrine gland and is mostly filled with triglycerides and closely resemble adipose tissues in composition. Therefore, the temperature should be raised to at least 70ºC, the melting point for fat, to destroy sebaceous glands. Also, energy has to be delivered in a short period of time to minimize damage to the surrounding tissues. During the development phase of AGNES, I put a great amount of time and effort to identifying the right wave form and type of RF energy to meet these conditions. 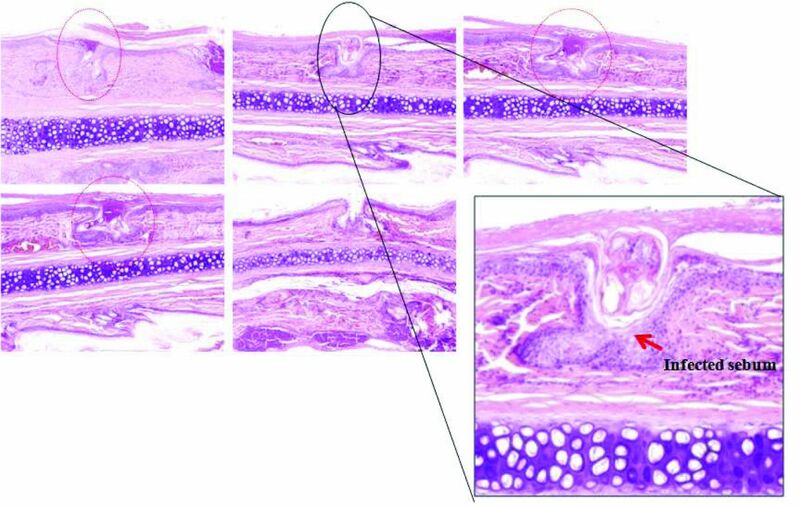 To allow selective destruction of sebaceous glands, the length of insulation should consistently cover the distance from the skin surface to the sebaceous glands. And the non-insulated part of the needle should be sufficiently long. The length of the sebaceous glands of the cheek is around 500 microns in normal skin but increases to over 1mm in acne. Therefore, the non-insulated part of the needle through which energy is delivered should be of sufficient length. The flat top wave would be most appropriate for this indication. High temperatures delivered in a short period of time are needed to destroy sebaceous glands and protect the surrounding tissues. For this objective, short-pulsed waves would be more suitable than continuous wave RF. As only energy sufficient for destruction of sebaceous glands is needed, the square wave form of RF would be effective (the sign wave form is not ideal as it decreases in energy level and leaves residual heat). In summary, following conditions should be met for selective destruction of sebaceous glands. First, the insulation of the needle should cover the distance from the skin surface to sebaceous glands for effective protection. Second, the non-insulated part of the needle that delivers energy should be long enough to fully destroy the enlarged sebaceous glands. Third, a sufficient level of heat should be used to destroy sebaceous glands. Fourth, short-pulsed, flat top waves should be used to minimize damage to surrounding tissues. Fifth, treatment protocols for effectively destroying enlarged sebaceous glands should be established. Development of AGNES was possible because I was a clinical dermatologist. I performed clinical and animal studies in the development phase of AGNES to establish scientific data. I injected acne causing bacteria into the inner flap of a rabbit ear to induce acne lesions. Then, the sebaceous glands of the acne lesions were destroyed using AGNES and found that sebaceous glands had disappeared 6 weeks after treatment. Figure 2. Histological imaging of animal tissues. To improve safety, a magnifying camera was installed for accurate viewing of insulation. I think such improvements of the device were only possible because I was a dermatologist myself. An engineer is not fully equipped with pathological knowledge of acne and would not be able to determine the right length of insulation, design animal studies or establish treatment protocols, etc. 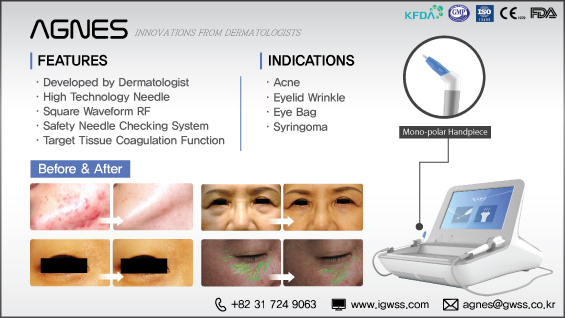 Therefore, devices like AGNES would not be possible unless a clinical dermatologist took part in the entire R&D process. However, even with the best efforts, a perfect product is not possible to obtain at a single try. The product only improves after countless revisions by a clinician through his/her experience in treating patients. First, one should remember that patients visit a dermatologist not because they want their sebaceous glands destroyed but because they want a clearer skin. Patients want to return to their normal daily life quickly with better skin and are not interested in learning about selective destruction of sebaceous glands. Therefore, I provide a comprehensive regiment that includes a week of oral antibiotics (and anti-inflammatory injections in severe cases) and scaling procedures for smoother skin. A comprehensive approach is a good way to increase patient satisfaction.